Day 2 of our human body exploration was all about the brain. I first asked Boo if she knew what the skull protected. The response was a glazed over “HUH?” look- I am sure all you teachers out there have seen this look before! I told Boo to look inside the skull for the answer. She lifted the flap and…..
what do you know, the skull protects the brain! In order to demonstrate the importance of the skull, we did a little experiment with eggs. I told my daughter a made-up on the spot story about a girl who was playing with baby ibexes on a tall mountain and then suddenly slipped and fell. At this point I told Boo to drop an egg on the floor. She was a bit hesitant at first- thinking it MUST be some type of joke to just throw food on the floor on purpose- but after seeing I was serious about it down came the egg. And what a mess it made. A great visual on why our brains need protection! We did drop another egg that was wrapped up with cotton and snuggled inside a plastic easter egg shell. It suffered only minor injuries- a small crack- nothing serious. Our brains need protection: lesson learned. There are SO many fun ideas out there on teaching your kiddo about the brain. Follow my board on Pinterest for more ideas. Tomorrow we tackle the lymph nodes!! This entry was posted in explorations, human body, learningtime, science and tagged brain on January 12, 2012 by ktoponce. My four year old is a very scientific little girl who is extremely interested in learning about the human body. 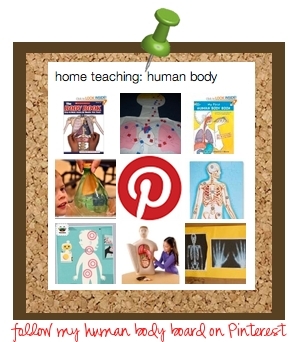 We just started a fun little mini unit on the body- so prepare yourself for A LOT of posts on this subject! You can’t talk about the human body without talking about the skeleton. I mean, without it we would be a lump of squishy organs and skin! Ha! To get us ready for our skeleton learning journey I decided to make a child-size paper body chart. At first I had great intentions of making separate body charts for each of the different systems- muscles, nervous, circulatory, digestive, etc BUT I decided as we learned about each system we would add it to just one paper body. I searched online for a human skeleton cut out and was so thrilled to find this child-size skeleton printout. I had to make some adjustments- my daughter isn’t quite that tall yet, so I shrunk the size a bit before printing. Due to size issues, I also had to add a different pelvic bone (found here), ribs (found here), and I ended up drawing a skull. The ribs are cut open so I can insert different organs as we learn about them, and the skull is actually two papers taped together at the top so I can put the brain inside. I am super excited about how this project is turning out! We will be adding to this paper body as we learn about different organs and systems. Putting the skeleton together was a family event- Boo is happily stirring juice while intently staring at the bones as we talk about them. And FYI: gluing bones on a body outline that is not a perfect match is tricky! We watched a School House Rock video on the skeleton, talked about calcium, and I printed out some X-Ray cards found at Chasing Marcus. We tried watching the Once Upon a Time series on the skeleton– not my favorite, but someone out there in the blogosphere might enjoy watching it. Boo watching skeleton movies online–don’t look too closely at my super messy desk! For more skeleton fun- check out my blog post on skeletons– it is definitely Halloween-ish, but it can be educational! There is also a post on a glow-in-the dark skeleton game that was lots of fun. Next post will be about the human brain! This entry was posted in human body, learningtime, science and tagged skeleton on January 11, 2012 by ktoponce.